Several years ago, I was inspired and moved seeing ‘Music Makes a City’ when it was first released in theaters. With its upcoming broadcast on PBS January 24th, I’ve been thinking again about what an incredible undertaking the Louisville Orchestra commissioning project was, and what a lesson it has been about the importance of commissioning new music and the power of music to knit together and lift up communities. 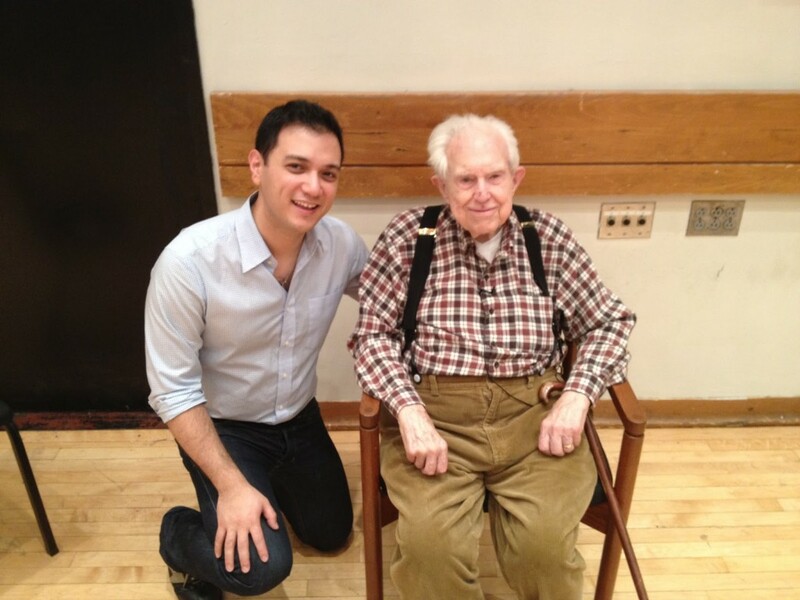 One of the many important composers interviewed in the film is Elliott Carter, who I was lucky enough to meet in 2011, shortly before his 103rd birthday as we worked on the world premiere of his new orchestral song cycle, “A Sunbeam’s Architecture”. I feel incredibly fortunate to have spent the brief time that I did with Mr. Carter working on “A Sunbeam’s Architecture” – it was a real honor and privilege to get to be the first person to sing a new work by one of the greatest American composers – of both this century and the previous one. While I found the score to be incredibly intimidating at first, I quickly fell in love with the piece, as I felt that it melded the musical heart and mind perfectly. Yes, it was complex and intricate, but rather than sounding dry, strange, and antiseptic – it was dramatic, riveting, and beautiful. The prospect of performing the song cycle was an intimidating one to say the least. There are many musicians who are fanatically devoted to Carter’s work, and, as they have devoted so much of their musical careers to deciphering his insanely challenging and intricate scores, they also happen to be some of the greatest musicians I have ever encountered. The ensemble that was formed for the premiere of his new cycle, which was at a special concert at the 92nd St. Y celebrating his 103rd birthday, was filled with these devoted “Carterians”, and putting the piece together with such an elite group of musicians was a nerve-wracking endeavor, indeed. Even more nerve-wracking was the prospect of Carter coming to rehearsal – I was horrified that I would do something wrong. For me, singing a composer’s work for them often feels like a daunting responsibility. Composers entrust us with the products of their hard work and these pieces that are expressions of themselves. My worst nightmare is to let them down while delivering their message. This sentiment was only intensified singing for a master like Elliott, who had been working with the world’s greatest musicians for well over 80 years at that point. During rehearsals, I thought often of ‘Music of Makes a City’ and the musicians of the Louisville Orchestra, who were encountering new music (such as Carter’s ‘Variations for Orchestra’) on a weekly basis, and what they must have felt like tackling premiere after premiere. After performing the piece, I found that my musical skills were much sharper than they had been before beginning work on the cycle, and I found that I was looking at the rest of my more standard repertoire with fresh eyes, meditating on the meaning of any and all notes and markings in any score. Thinking back on ‘Music Makes a City’, it was clear that this is the legacy of the Louisville Orchestra’s gargantuan commissioning project for all of us – to keep looking at all music from new vantage points, and to not take any note or cultural institution for granted. Music Makes a City Now, a new original web series inspired by the film, follows musical visionaries who build communities with great music. In Season One: Louisville, a bold young orchestra conductor (Teddy Abrams) pulls out all the stops in Louisville, KY.
Sign-up to receive updates about Music Makes a City. ©2019 Owsley Brown Presents. All Rights Reserved. Photos courtesy of George Bailey and Thomas V. Miller. ©The Courier-Journal, The Rockefeller Foundation, The Louisville Orchestra and The University of Louisville Archives, Louisville, KY.